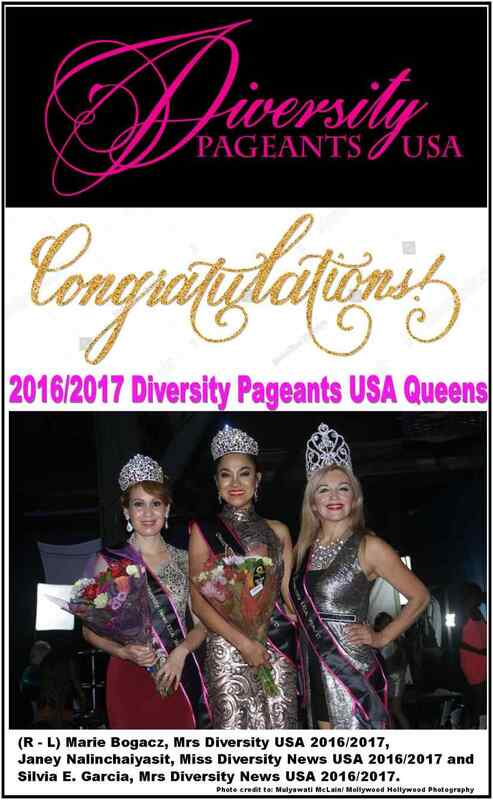 2017 Diversity Pageants USA New Queens Re-Crowning, Fashion Shows and Red Carpet Event A Success! LOS ANGELES – Sept. 2, 2017 — Diversity News Productions announces that their 2017 Diversity Pageants USA New Queens Re-Crowning, Fashion Shows and Red Carpet were a Success. 2017 Diversity Pageants USA New Queens Re-Crowning, Fashion Shows and Red Carpet Event was held on August 26, 2017 from 5:00 pm to 9:00 pm at SAS Movie Studios 501 S. Avenue 17, in Los Angeles, CA 90031. The event featured 2 red carpet arrivals, 2 live performances and 3 fashion shows. The live performers were the lovable and legendary Singer/Performer Linda England and Singer-Songwriter/Actor/Recording Artist Songwriting Shane. The three fashion shows designers featured on the runway were: Celebrity Fashion Designer Ammar Rhaima from Ammar’s Tailoring and Celebrity Make Up and Sylist, Fashion/Graphic Designer Gabriel Escamilla Fashion/Mask Designs. Also Diversity Pageants USA Queen Marie Bogacz, Mrs Diversity Pageants USA and Fashion Designer from her own brand MB Style Collections. ” Ladies and Gentlemen, It is my honor and pleasure to introduce Diversity Pageants USA 2016/2017 Royal Court. Marie Bogacz, Mrs Diversity USA 2016/2017, Janey Nalinchaiyasit, Miss Diversity News USA 2016/2017 and Silvia E. Garcia, Mrs Diversity News USA 2016/2017. As producer I am very happy to have my complete royal court. Thank You.” said Steven Escobar, Founder, CEO, President and Executive Producer of Diversity Pageants USA formerly Diversity Pageants. Queen Silvia E. Garcia, Mrs Diversity News USA weared on the red carpet custom dresses designed by Fashion Designer Dalila Landeros, disenadora de moda. Also Queen Janey Nalinchaiyasit, Miss Diversity News USA wearing Kevan Hall Designs dress. During the event, Queen Marie Bogacz, Mrs Diversity USA received a new sash with it was placed by special guests Teyanah Sanders (Junior Miss Universal City 2017) and Deanara Aragon (Miss Pre Teen Universal City 2017). Then they re-crown 2016 Diversity Pageants Mrs Diversity News 1st Runner-Ups! Silvia E. Garcia from Mexico and Miss Diversity News Janey Nalinchaiyasit from Thailand. Again the special guests Teyanah Sanders (Junior Miss Universal City 2017) and Deanara Aragon (Miss Pre Teen Universal City 2017) and Cali Rossen, (Ms North Hollywood Woman Elite 2017) help to crown the new queens along with Queen Marie Bogacz, Mrs Diversity USA. Diversity Pageants USA Official After Party was held at Elevation Bar and Lounge formerly Johnny O’Brien at 5248 Van Nuys Blvd, Sherman Oaks, CA 91401 on Saturday, August 26, 2017 from 10:00 pm to 1:00 am. Diversity News Productions 2017 Diversity Pageants USA New Queens Re-Crowning, Fashion Shows and Red Carpet Event sponsors were: Hollywood Actor’s Showcase, SAS Movie Studios, World Wide Vital Marketing & Public Relations, Diversity News Magazine Awards, Skincare Treatment by Galina Capanni, SouthMain Rejuvenation Institute, Bob Delgadillo Photography, Maxx Promos by Mutch Carino, Diversity News Magazine, Diversity News Television, Diversity News Radio, Miss Diversity News Beauty Pageants Magazine, Diversity News Publications, Party By 5, GOT Anchored Online Magazine, Manila Up International Magazine, Ammar’s Tailoring, MB Style Collections, Gabriel Escamilla Fashion/Mask Designs, Dalila Landeros, Disenadora de Moda, SG Promotions, Tsingtao Beer, Cheesecake De Granger, Doris Kitchen Restaurant, Elevation Bar and Lounge. Also the Executive Producer Steven Escobar from Diversity News Productions Thanks Singer/Performer Linda England, Singer-Songwriter/Actor/Recording Artist Songwriting Shane, Actress, Model and Queen Marie Bogacz, Mrs Diversity USA and Actress and Host Thushari Jayasekera, Kyron Jones, Eddie Perez, Enriqueta M Briones, Claudia Perez, Jacob Prieto, Danielle Pereira, Linda Satloff Krongold, Arthur Bukujian, Alex Leon. The 1st annual Diversity Pageants USA formerly Diversity Pageants crowning ceremony and red carpet event was held on November 5, 2016 at The Performing Arts Education Center, new state-of-the-art venue on the campus of Agoura High School in Agoura Hills, CA. The 1st annual Diversity Pageants USA formerly Diversity Pageants was executive produced by Steven Escobar (http://stevenescobar.diversitynewspublications.com/) from Diversity News Productions.